The double skinned construction of the Venedig Grillbar means it can burn several different types of fuel allowing you to start off cooking on charcoal and then moving on to logs or firewood when you want to sit round the fireplace to keep nice and warm! For grilling steaks and chops and for the best char-grilled flavour you can purchase the cast iron grill accessory. The combination of a cast iron grill and cooking over charcoal is the absolute best barbecue you can have. Dimensions: H 93cm x W 110cm x D 65cm. Cooking dimensions: 54cm x 34cm. 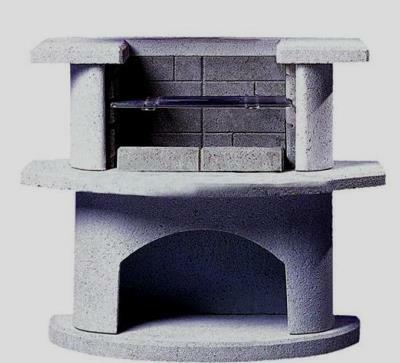 Buschbeck being the only brand of masonry barbecue to achieve the very stringent German TUV/GS safety standard, your Buschbeck Venedig Grillbar barbecue will last for many years to come. Free Delivery Usually 7 to 14 Days.